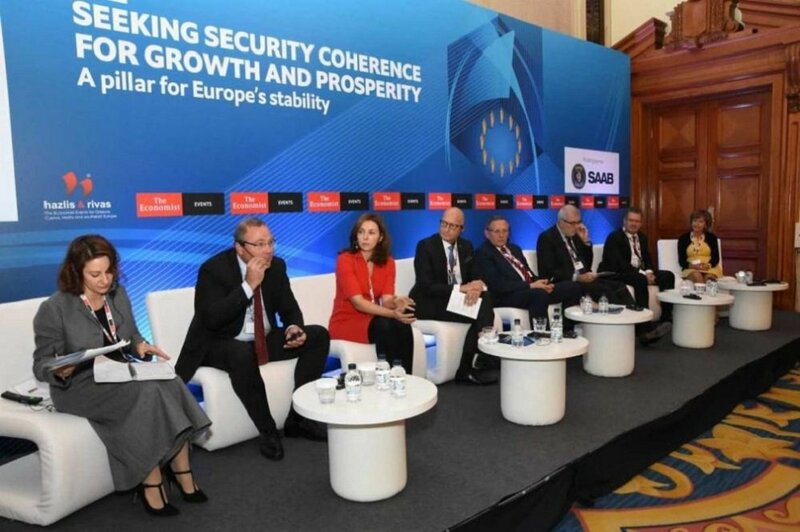 SOFIA, Bulgaria (BulgarianMilitary.com) – Yesterday, the Bulgarian Deputy Minister of Defence Atanas Zapryanov together with Minister of Foreign Affairs Ekaterina Zaharieva took part in the conference “Seeking Security Coherence for Growth and Prosperity – A pillar for Europe’s stability”, which was organized by the British magazine – The Economist. The key topics being covered on the conference agenda included critical issues such as collective security and economic and political cohesion between EU northern, southern and eastern member states, learned BulgarianMilitary.com. The event was held at the Sofia Hotel Balkan and among the participating speakers were the European Commissioner for Internal Market, Industry, Entrepreneurship and Small and Medium-Sized Enterprises Elżbieta Bieńkowska, the former Chairman of the European Union Military Committee General Michail Kostarakos and Bulgaria’s Deputy Chief of Defense Vice-admiral Emil Eftimov. Deputy Defence Minister Atanas Zapryanov took part in the first panel discussion of the conference – “Generating Growth in a Europe of Stability and Prosperity”, speaking on the topic “Security and Defence Sector and its Impact on the Economy and Business: Innovation, Research and Development of the Defence Industry”. In his speech, he highlighted the opportunities that are open to the Bulgarian defence industry for cross-border cooperation and participation in defence research and development projects, which will be funded by the European Commission. Atanas Zapryanov focused on new security and defence initiatives in Europe, such as the Permanent Structured Cooperation (PESCO), the European Defence Fund and the EU Defence Industrial Development Programme. Bulgarian Foreign Minister Ekaterina Zaharieva, who also participated in the first discussion of the conference, said in her talk with European Commissioner for Internal Market, Industry, Entrepreneurship and Small and Medium-Sized Enterprises Elżbieta Bieńkowska, that Bulgaria supports the European Defence Fund and requires it to reach small and medium-sized enterprises such as the Bulgarian defense industry companies. In turn, Elżbieta Bieńkowska pointed out that the European Defence Fund and the related EU Defence Industrial Development Programme allocate new funds and open new opportunities to the industry in Europe. But her meetings with a number of representatives of the small and medium-sized businesses in the sector show that the problem with them is that they are usually not familiar with the new investment opportunities provided by these EU initiatives. During their talks, both agreed that Bulgaria could organize an event to meet the major defence industry producers with local companies. Bulgaria’s Deputy Chief of Defense Vice-admiral Emil Eftimov took part in the second discussion topic of the conference: “Seeking Security Coherence for Europe”. He spoke to the audience on the topic “Military Capabilities within the Context of the Current Defence Related Initiatives (PESCO, EDIDP, EDF)”.